It was turned into a movie, which has a full circle aspect to it: Millers 300 was partly based on the 1962 film "300 Spartans." Maybe Miller had always wanted to make this follow-up, prequel/sequel storyline, seeing the other side...is this supposed to end the anti-Iranian controversy? Having read the first four issues of the full-mouthed titled "Xerxes: the Fall of the House of Darius and the Rise of Alexander," I can't say for certain that stemming controversy is one of Miller's motivations. Mainly because there isn't much going on at all in this series. There are some sweeping panels, but what I mean is that nearly a third of each issue are sweeping double-page layouts, like taking one of the novel things about the first miniseries and exploiting it to a ridiculous degree. I call it exploitation because these sweeping layouts are just not as good, which isn't fair, but while not as good, they're also not very appealing in their own right. Xerxes plays a small role in issue 1 and appears in issue 2 near the end, while both issues 3 and 4 begins with Xerxes being murdered. 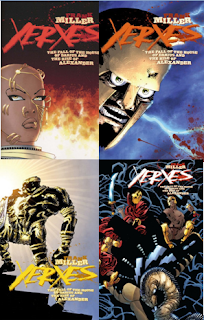 Issue 3 backs it up and we see a little before the death, while issue 4 sees more of the start of Alexander's attacks on Xerxes' kid, Darius III. The name of the series is nominally Xerxes, right? So I wait...I'll purchase the final issue, of course, and I don't expect to find the artists and tight story from 20 years back, but it is precisely that twenty year old memory that leads fans like me to this nearly incoherent story and mostly unappealing art. And that says something, right?